Are your carpets looking dingy and worn out? Are your hardwood floors in need of a good scrubbing? There’s no need to go out and buy new carpeting or have new flooring installed – you can just call Kent Clean! We offer professional floor cleaning services in the Maryland area, including Eldersburg, Westminster, Columbia, Ellicott City, Towson, Owings Mills, Carroll County, Howard County, and Baltimore County. We also use environmentally friendly, green products to keep your residential space looking its best. Contact us today for more information on our floor cleaning services. Commercial flooring sees a lot of traffic throughout the year and with that traffic, comes dirt and grime. Don’t lose customers and clients to unsightly flooring – call a professional cleaning company instead! Kent Clean provides a variety of Maryland commercial floor cleaning services including power washing sidewalks and other concrete surfaces. 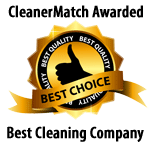 We service a large variety of businesses, but specialize in floor cleaning for Maryland restaurants. Contact us today for more information on commercial floor cleaning services.